Recombinant full length, Human 15 Lipoxygenase 1 produced in HEK293T cells (NP_001131). HEK293T cells transfected with pCMV6-ENTRY 15 Lipoxygenase 1 cDNA; HepG2, HeLa, A549, COS7, MDCK, PC12 and MCF7 cell extracts; Human breast, Human pancreas carcinoma, Human thyroid carcinoma, Human endometrium, Human endometrium adenocarcinoma, Human prostate carcinoma and Human bladder carcinoma; COS7 cells transiently transfected by pCMV6-ENTRY 15 Lipoxygenase 1. The clone number has been updated from 3G8 to OTI3G8, both clone numbers name the same clone. Our Abpromise guarantee covers the use of ab119774 in the following tested applications. WB 1/500 - 1/2000. Predicted molecular weight: 75 kDa. Converts arachidonic acid to 15S-hydroperoxyeicosatetraenoic acid. Also acts on C-12 of arachidonate as well as on linoleic acid. Lipid metabolism; leukotriene D4 biosynthesis. Belongs to the lipoxygenase family. ab119774 at 1/150 dilution, staining 15 Lipoxygenase 1 in formalin-fixed, paraffin-embedded Human breast tissue by Immunohistochemistry. ab119774 at 1/150 dilution, staining 15 Lipoxygenase 1 in formalin-fixed, paraffin-embedded Human pancreas carcinoma tissue by Immunohistochemistry. ab119774 at 1/150 dilution, staining 15 Lipoxygenase 1 in formalin-fixed, paraffin-embedded Human thyroid carcinoma tissue by Immunohistochemistry. ab119774 at 1/150 dilution, staining 15 Lipoxygenase 1 in formalin-fixed, paraffin-embedded Human endometrium tissue by Immunohistochemistry. ab119774 at 1/150 dilution, staining 15 Lipoxygenase 1 in formalin-fixed, paraffin-embedded Human endometrium adenocarcinoma tissue by Immunohistochemistry. 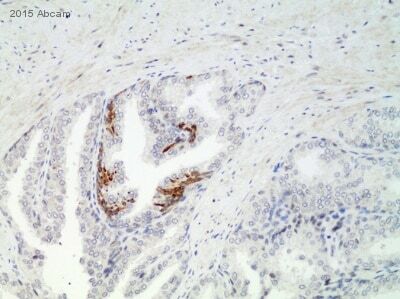 ab119774 at 1/150 dilution, staining 15 Lipoxygenase 1 in formalin-fixed, paraffin-embedded Human prostate carcinoma tissue by Immunohistochemistry. ab119774 at 1/150 dilution, staining 15 Lipoxygenase 1 in formalin-fixed, paraffin-embedded Human bladder carcinoma tissue by Immunohistochemistry. ab119774 at 1/100, staining 15 Lipoxygenase 1 in COS7 cells transiently transfected with pCMV6-ENTRY 15 Lipoxygenase 1, by immunofluorescence. Please see below the responses to your questions. Hopefully these will help you fix the problems. However, I want to convey you that I dont need a replacement as the purpose was solved by reverting to antibodies from other sources. I can provide you the info. that would tell that I had indeed bought these anitbodies from other sources. However, I would greatly appreciate if you could send me the other two anitbodies that I have been using from you and are wuite robust and working great. This will help me save some money. 1) What application were the antibodies used in? What kind of results were seen (high background, no staining/bands, etc)? Mouse monoclonal [3G8] to 15 Lipoxygenase 1: Used for western on macrophages protein extracts. 1:500. No band was seen. After frustrations, the western data was generated using other ALOX15 antibody that worked really well. Rabbit polyclonal to CD3: used for Immunohistochemstry (fluorescent) on frozen spleen. (1:100 conc. was used. O/N in cold room) Staining was not achieved. Again, tried other antibody that worked and the data was generated. 2) What species were the samples from? What kind of tissue/cells were used? Mouse monoclonal [3G8] to 15 Lipoxygenase 1: mouse alveolar as well as BMDM macrophages. Rabbit polyclonal to CD3: mouse frozen tissue sections, spleen. 3) Could you describe the protocol used? Please include the antibody dilution/concentration and components of the blocking solution. Blocking for western was odyssey blocking buffer by Li-Cor. For IHC, blocked was 5% goat serum in PBST. Thank you very much for sending all of this information. I'm sending free of charge vials of ab39626 and ab39628 on the order ***, which should arrive on Monday. Just to confirm, the macrophages were from mice or a different species? We haven't tested ab119774 with mouse samples, so wecan't guarantee that it reacts with the mouse protein. If you'd ever like to try an antibody with an untested species, we do have a testing discount program that you might be interested in. Feel free to contact me if you'd ever like more information. If you have any questions or if there is anything else that we can do for you, please let me know and I'll be happy to help. Have a nice weekend. As evident from my account history, I have extensively used your product and had minimal problems with the antibodies. However, two of the antibodies from my last order never worked. I ended up in ordering antibodies from other sources and have used them to generate the data. Since I have wasted lot of time and resources on getting these two antibodies worked, I thought I should request either refund or replacement for 15-ALOX and CD3 antibodies. I am very happy with FIZZ1 antibodies (AB39626) and AB39628. I would appreciate if you could send me these two antibodies or issue me refund/credit. Thank you so much for contacting us and for letting us know about the trouble with these two antibodies. We do fully guarantee our products to work as stated on the datasheets in tested species and applications, so if the antibodies did not work as they should have, we can provide replacements. For our records, could you please tell me the following information? I look forward to hearing from you. Please let me know if you have any questions or if there is anything else that we can do for you, and I'll be happy to help.